THE HEDGE ARTS PROJECT. INSPIRING CREATIVITY THROUGH NATURE. Woodland Workshop: A green-creative writing workshop being held at Aintree University Hospital NHS Bluebell Woods site. Led by Bernadette McBride - founder of The Hedge Arts Project. Hear our founder Bernadette McBride being interviewed live on BBC Radio Merseyside: https://www.bbc.co.uk/programmes/p062cst1#play simply go to 01:23 mins along on the programme to hear the interview! The next event will take place at the University of Liverpool for Wellbeing Week 2018 - see the UoL website for details. In November 2017 our idea for a social enterprise was awarded start-up funding and business support from the Green Guild at the University of Liverpool. We won the Green Guild Social Enterprise Challenge after presenting an idea to the judges for a project that aims to tackle environmental inequality, educate around green issues, whilst inspiring creativity through nature. The project aims to achieve this by combining creative writing workshops with green projects. Several studies have been conducted that show the positive physical and mental health benefits of being outside and taking part in green projects, whilst similar studies have also shown the positive physical and mental health benefits of Creative Writing. In this ever-digital age, there has been a rise in physical and mental health problems in adults and children alike, whilst environmental issues are at the forefront of the current news, global policies, and community agendas. The Hedge Arts Project aims to creatively engage children and adults to inspire them to be the authors of their ‘own story’, in contrast to the powerlessness often felt by individuals when discussing green issues such as climate change. We have rolled out the first of our schools projects this year at LIPA Primary School in Liverpool, and we plan to continue these sessions across schools in Merseyside and beyond, alongside other community initiatives. In 2018 we worked with LIPA Primary School offering a series of creative writing classes for the children in the year 1 group around their curriculum map ‘Into the Woods’. The children retold the story of Little Red Riding Hood in their own words and made a pictorial narrative ‘model village’ of the story using recycled objects to make the figures of red riding hood and the wolf and other characters, whilst using planting skills to grow the woods. School Workshop: A green-creative writing workshop being held at LIPA Primary School in Liverpool led by Bernadette McBride - founder of The Hedge Arts Project. 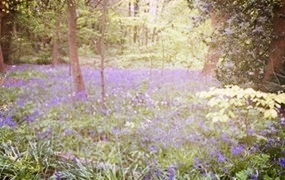 The Bluebell Woods Poetry Competition: A nature-themed poetry competition with an outdoor creative writing workshop organised by The Hedge Arts Project for PARTIA at Aintree University Hospital NHS. Meeting point: outside the Elective Care Centre which is plot 15 on the hospital site map. Poems of any style exploring the themes of ‘nature’ and ‘friendship’. Winning poems will be inscribed on a natural wood sculpture installed to mark the ‘Friends of Bluebell Wood’ 20th anniversary and winners will receive a £50 Waterstones book voucher. Runners-up will receive a planting kit, and their work will be displayed within the hospital. The competition will be judged by author Frank Cottrel-Boyce and The Hedge Arts Project team. the subject heading ‘Poetry Competition’.